Lt Col Nick Woolgar and Jamie MacLeod begin their Tweed Challenge this weekend. A Borders businessman is taking to the Tweed next week for a charity challenge already past the £35,000 mark before it’s even started. Jedburgh-born Jamie MacLeod, 49, now working as an investment manager in Salisbury, Wiltshire, will kayak the 97-mile length of the river to raise funds for UK charity Veterans’ Aid. Jamie MacLeod and Nick Woolgar in training. 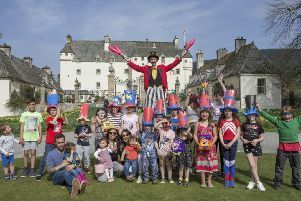 Jamie, formerly managing director of Scottish Widows Fund Management and presently chief executive officer of Bordier UK, was married in Jedburgh and still visits the region each August with his family. He and friend Nick Woolgar, 46, an Army officer, are undertaking the challenge to support a charity providing practical support for ex-services personnel in crisis. The two men share a deep unease about the plight of rough sleepers, they say. The friends will paddle the length of the river, from its source at Tweed’s Well to its mouth at Berwick in Northumberland in a 14ft kayak over six days, starting tomorrow. “My concern is river conditions,” Jamie said. “The Tweed can be brutal and easily rise 10ft or more in 24 hours after heavy rain. “It can become dangerous after rising just two feet. “We will paddle hard when it’s safe and try to get out of the way of floating trees and debris on any big floodwater. Jamie is undeterred by his children’s view that he is “too fat to do it” and began training in earnest at Salisbury Canoe Club, on the Hampshire stretch of the River Avon, in February. “It’s tiny compared to the Tweed but a great place to learn how to paddle for the first time,” he added. “If conditions are kind, we should finish the trip in seven days or less.